Olana’s 250-acre naturalistic landscape is one of Frederic Church’s great works of art, and it exists today as one of the most intact artist-designed landscapes in the United States. Because it was created by a major Hudson River School painter in the birthplace of that art movement, the landscape at Olana possesses an exceptional sense of place – genius loci. Church was intimately involved in all aspects of his landscape’s creation and design. “I am busy landscape architecturing!” wrote Church in 1887. His large-scale composition included a working and ornamental farm, meadows, outbuildings, an “artificial” lake, native woodlands, and more than five miles of carriage roads, so that visitors could move through and experience Olana’s crafted foreground against a backdrop of sublime and far-reaching views. In 1860, two months before his marriage to Isabel Carnes, Frederic Church bought a 126-acre farm. Maintaining a working and ornamental farm (a ferme ornée) was an integral part of Frederic Church’s long-term vision for his property and his family. Church would write “The Farm” at the top of his correspondence, and Theodore Cole, the son of his teacher Thomas Cole, was hired as a property manager to help establish this vision. Church hired Richard Morris Hunt to design a small clapboard house as a home for his family. A key part of Frederic Church’s large-scale design was the acquisition of additional land parcels, so that he could build what we now know as Olana. Expansion in the 1860s beyond the original 126-acre purchase enabled Church to incorporate many new features, including additional views to the Catskills and the Taconic Hills, as well as opportunities to create attractions on his own land. A key parcel was the top of the hill where his farm stood, known as the Sienghenberg (Dutch for “Long Hill”). By acquiring the entire Sienghenberg Church could site his main house, establish woodlands and meadows, and create a more expansive road system which would transport visitors up and through his creation. The highest point of elevation at Olana occurs along the Sienghenbergh at 495 feet above the Hudson River. Church’s work at the top of the hill included siting and building a stable and coachman’s house, as well as working with Calvert Vaux (co-creator of New York’s Central Park) to build his Persian-inspired house. This house, built largely of native stone, served as a focal point within Church’s larger designed landscape, and it included a series of terraces and balconies from which to experience Olana’s sublime views. Construction close to the main house included a semi-circular East Lawn, as well as stone retaining walls to elevate roads, which provided horse-drawn carriages with a heightened final arrival experience and a choreographed way to head back down the hill. A native fern garden was situated under the northern retaining wall, and a “mingled” flower garden followed the contours of the long, curving south-facing wall – and provided easy access from the main house. Church continued work within Olana’s landscape throughout the rest of his life, and this included the construction of Ridge Road in 1884. He also acquired additional acreage, including the North Meadow (50 acres, 1878) which served both as grazing fields and as the foreground view from Ridge Road. In 1884, Church designed Crown Hill Road, which brought visitors up to the peak of a distinctive landform within Olana’s 250 acres. 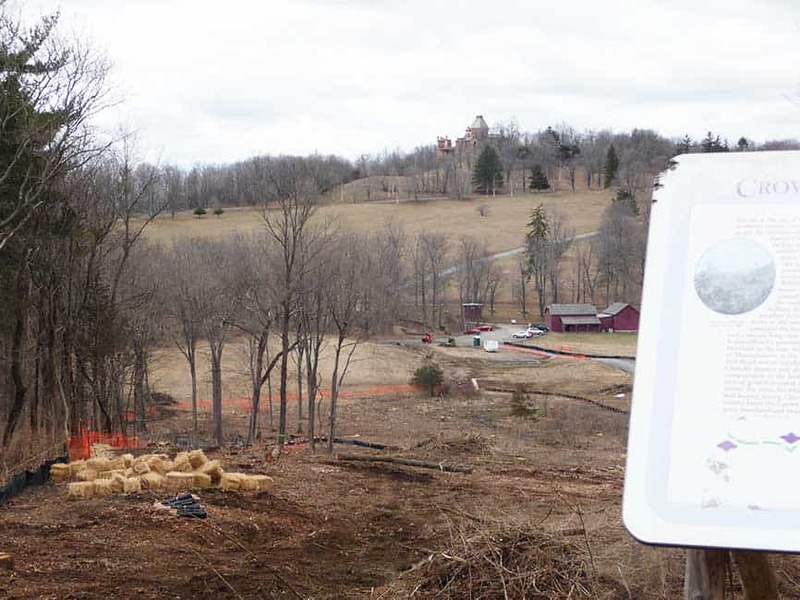 From there, visitors encountered an elevated view over Olana itself: the farm, parkland, and the main house which was framed by woodlands of native trees. 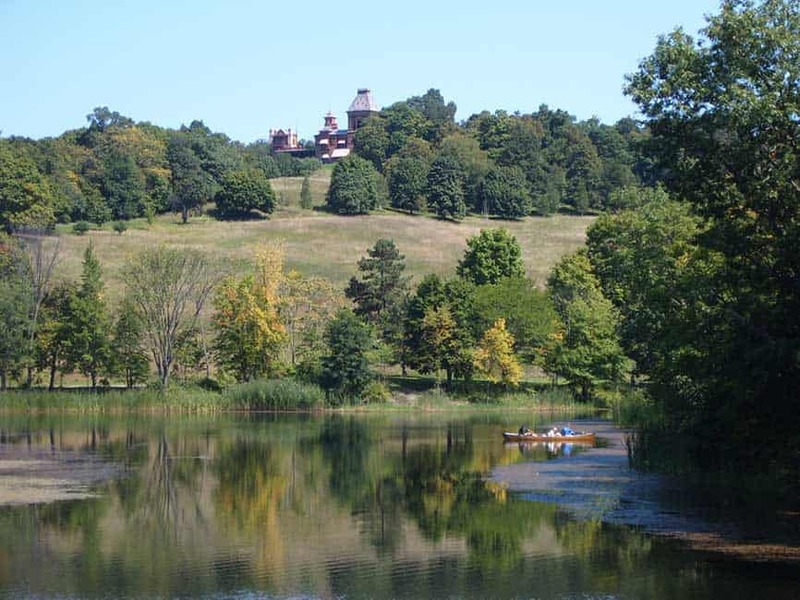 Olana’s man-made lake – called “artificial” in Church’s’ day — is an integral part of Frederic Church’s large-scale vision. The lake was created by Church out of a swampy area of his property, and it functioned as a design feature. The southern windows in the main house (most of the major rooms) still provide views down over Olana’s parkland and this expanse of water, and the shape of this 10-acre lake – and its horizontal plane – echo the shape of Inbocht Bay several miles south in the Hudson River. Church also created a road which threaded through the woodland close to the lake’s perimeter, and this road provided a series of vantage points across the lake to the park and house above. 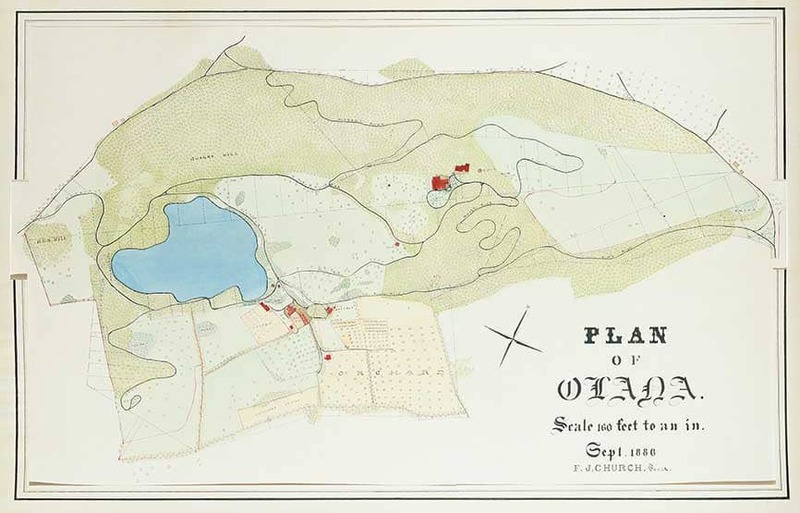 Olana’s lake was dug by hand – before machinery for this existed — and was largely formed by excavating “muck” over a period of twenty years, starting when Church purchased his first land parcel. This muck was valuable soil and was spread over fields to helped establish and feed new plantings. Ever the businessman, Church arranged for a laborer to remove muck in exchange for keeping half of it. The lake’s shape followed the contours of the existing land, and a dam was constructed so that it would fill. There was a surge of activity in 1878 and 1879, when Church wrote, “The lake is overflowing, the birch canoe is ready…” Olana’s lake was more than ornamental, though. In addition to recreation – boating, skating and fishing – it also served as a source of water. Church ultimately installed a system which pumped lake water up to a cistern in the main house, and today water is still pumped from Olana’s lake up to a water tower near the main house. An ice house was situated in the vicinity of the lake, so that harvested ice could be stored during the warmer months. When Frederic Church began creating Olana, part of his large-scale design was to establish native woodlands. Throughout the 19th century, the Hudson River had served as an industrial highway down to New York City, and much of the land close the river – including what would become Olana — had been largely deforested by industry and commerce. 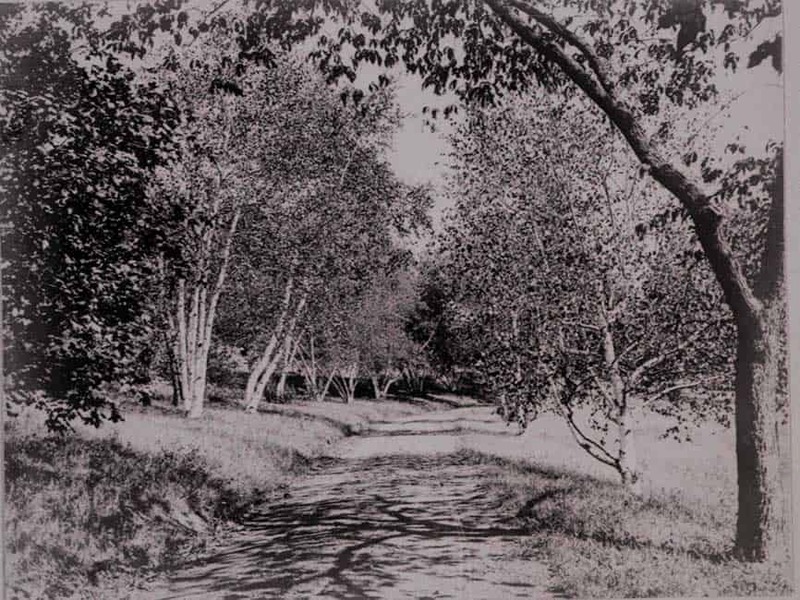 With an eye toward his particular landscape’s topography and views, Church planted thousands of native trees, including maples, birches, hickories, hemlocks, chestnuts, pines and oaks. 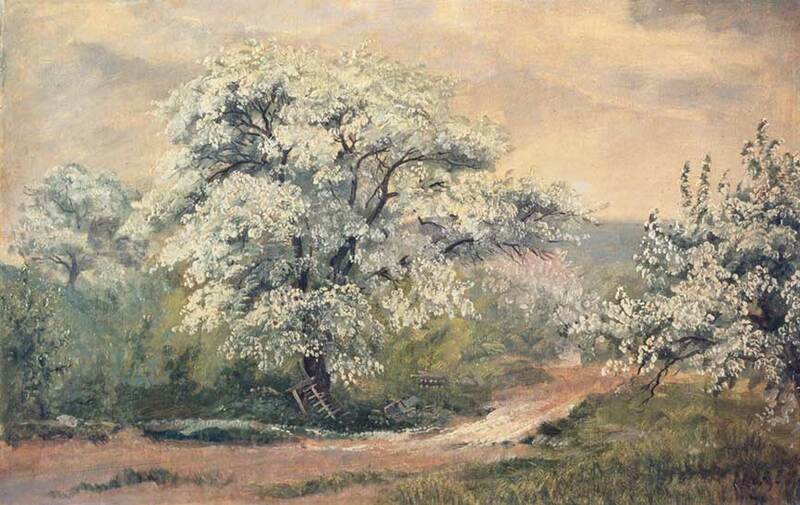 Through planting trees, Church combined a painter’s eye with a naturalist’s touch to further develop his landscape composition. 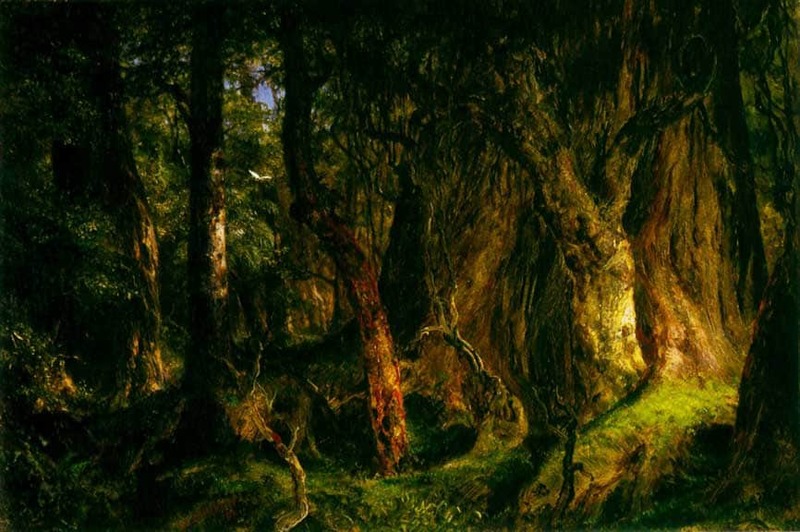 “For several seasons after I selected this spot as my home,” said Church, “I thought of hardly anything but planting trees, and had thousands and thousands of them set out on the southern and western slopes.” In some areas, trees were created to form dense woodlands, and roads were designed to lead guests through shadows and foliage. Trees also served to frame particular distant views. In some instances, trees were planted to screen out particular buildings, such as the stable, so that visitors could experience Olana in an orchestrated and stylized way. In Olana’s park, for example, trees were planted amidst a meadow in varying combinations – in tight thickets, singly and in groups — and they were also planted along roads to accent particular routes. The roads at Olana are a key element within Olana’s artist-designed landscape. Laid out by Frederic Church, they serve to guide visitors through a series of composed and carefully crafted scenes. These roads were envisioned by Church for both pleasure and for utility, and they provided visitors with a “cinematic” display of moving pictures. Roads ascend steep hillsides or veer close to a precipice or to water, for dramatic effect. Church’s road-building efforts included a designed arrival experience at the main house, and it was his carefully-placed roads which enabled visitors to visit the farm, circle the lake, and fully experience Olana’s iconic views. Olana’s 5-mile road system includes the North Road which led visitors from Hudson up along a steep and wooded switchback route for a pronounced sense of discovery at the top of the hill. The South Road provided visitors who arrived by ferry with open and expansive views. Bethune Road steeply zigzagged down toward the river. The Farm Road connected the farm to the main house, and the Lake Road incorporated foreground water views. Ridge Road offered visitors sweeping meadow and distant mountain views, and it was during this construction period that Church famously wrote of his design efforts “I have made about 1-3/4 miles of road this season, opening entirely new and beautiful views. I can make more and better landscapes in this way than by tampering with canvas and paint in the studio.” While Church was creating Crown Hill Road, his mother-in-law, Emma Carnes, wrote: “Mr. C is making another drive, thinks it’s a secret!” Some of Olana’s roads were constructed to follow the site’s undulating topography, and occasionally blasting with dynamite was required to achieve Church’s full intent. Native red shale quarried on site was spread over these roads, and visitors would travel these routes on foot or by carriage. Church was even known to have imported three white donkeys from Syria, and guests could be pulled on donkey carts as a more exotic way of experiencing the scenery along Olana’s roads. Since the pivotal period Olana was saved from destruction in 1966, numerous steps have been made to restore it to Church’s original vision and to make it accessible as a highly-visited public park. Some of these projects are quite visible, and some would not be noticed by the first-time visitor. These projects include the rehabilitation of the flower garden and the dredging of the lake. Aquatic invasive plants were managed, so that the full expanse of the lake’s surface remains visible. Early 20th century garden elements and paths close to the main house were removed, and the historic fence above the carriage turnaround was recreated out of mountain laurel. The overhead utility wires and poles which marred the western hillside have been buried underground. Second-growth woodland and invasives have been removed to restore views of the Hudson River and views north and east. The farm fields have been cleared, stone walls were revealed, and sustainable native meadows have been established in the historic orchard. Early farm building foundations were revealed, and Cosy Cottage and the Wagon House have undergone restoration and rehabilitation. The first phase of restoration has been completed on Crown Hill, and views have been opened up again. The North Meadow restoration project is underway, and plans have begun to restore the landscape closest to the main house. This includes restoring the full view of the Hudson River.